Tick, tick, tick is all what we hear while waiting for the approaching time of fun and happiness. The chance for fair celebration of glory makes it compulsory for a grand toast to rise for a new beginning. With all that busy and boring routine life and with the upcoming New Year knocking the door, V Resorts brings you a new hope not just for you but also for that someone special! 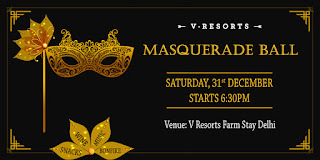 Glow up your sleeves in 2017 with V Resorts Masquerade Ball, as we bid goodbye to 2016. Raise a toast in New Year’s Eve event with V Resorts which offers spirituous drinks and crispy snack. Make a rendezvous with your partner with the soulful music in town and make the world dance with you! Pleasure will be all yours!